This collection contains video recordings of the lectures from the Regional Training Course on Culture-based Fisheries in Inland Waters, held at Nha Trang University, Vietnam, from 30 October to 8 November 2017. The objective of the course was to provide participants with the skills to assist local communities to plan and manage culture-based fisheries. There are many initiatives underway which are designed to increase food supply, employment and income opportunities in developing countries, most of which require considerable capital inputs. Often overlooked, are the opportunities to produce more food from the natural productivity of local ecosystems. 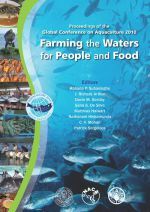 Culture-based fisheries are a relatively simple and low cost technology that can deliver nutritional and economic benefits to rural communities, which often have few livelihood options. The course was sponsored by the United Nations University Fisheries Training Programme (UNU-FTP). A discussion of practical measures for stock assessment. Presentation on the assessment of fish stock dynamics in a culture-based fisheries context. Better management practices for stocking and transport of seed for culture-based fisheries.